Christian “Suicune Master” Patierno earned his second straight championship belt for Pokkén Tournament at this past weekend’s Community Effort Orlando. You might not have known that, even if you watched the stream, because the commentators and the on-screen overlay referred to him by a slightly different name. At CEO, he wasn’t “Suicune Master.” He was “Sui Master,” the latest in a long line of unexplained adjustments on official Pokémon broadcasts. 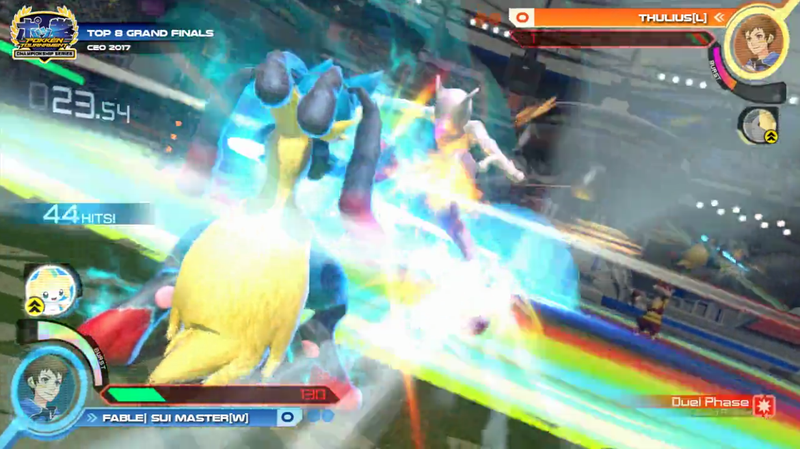 Since launching in arcades in July 2015 and carrying on into March 2016 when it arrived on Wii U, Pokkén Tournament has had a passionate competitive community surrounding its unique mixture of 2D and 3D gameplay. The Pokémon Company capitalized on this with last year’s Pokkén Tournament Championship Series, a circuit of both official and grassroots events that fed directly into the World Championships they held for their video and trading card games in August 2016. With their backing, Pokkén players threw themselves headlong into competition, happy to be recognized by their parent company. With official support comes restrictions, and something was apparently wrong with Suicune Master’s chosen name. It wasn’t changed in May 2016 during the Pokkén Tournament Championship Series kick-off event at DreamHack Austin, but it was truncated for last year’s CEO broadcast. Although he’s since picked up Lucario in competition, Suicune Master started out as a masterful wielder of Suicune, the water-based legendary dog from Pokémon Gold and Silver who is capable of controlling the battlefield with a wide variety of projectiles and sweeping attacks. . As Pokkén Tournament numbers grew, he quickly emerged as one of the best players in the United States, placing high in just about every event he entered. The new Sui Master tag was confusing, if not wholly unintelligible, but it stood out as weird that such a policy was even in place, especially with how sporadically it was enforced. In May 2016, an official Pokkén Tournament Championship Series event at DreamHack Summer saw a German player named Lion “Schiggy” Meier place third. Schiggy, the German name for Squirtle, wasn’t changed. Additionally, Jacob “ThankSwalot” Waller, whose handle is a pun on the poisonous Swalot, wasn’t affected at the Pokémon US National Championships in July 2016, but Suicune Master still saw his name whittled down. Furthermore, the rule wasn’t enacted at the Evolution Championships Series that year, only to again rear its head at the World Championships. Thanks to the announcement of a 2017 Pokkén Tournament Championship Series and the impending arrival of a long-awaited Switch port, the community arrived in Orlando last weekend with an increased enthusiasm, hoping to perform well enough to earn a spot at Worlds later this year. Suicune Master and ThankSwalot were among the 121 entrants, and both made it to the finals. Along the way, it became clear that Pokémon’s name policy was exactly the same as it had been in 2016. As usual, Suicune Master became Sui Master, but this time around, ThankSwalot wasn’t spared, becoming Thanks A Lot and ruining a great name in the process. When asked for specifics on the policy by Kotaku, The Pokémon Company declined to comment. The oddity here comes from the fact these players are using official Pokémon names. It’s not like they’re waltzing into events promoting Digimon, Monster Rancher, or, god forbid, Robopon at Pokkén Tournament Championship Series events. And due to The Pokémon Company’s silence on the matter, no one is sure why this is even an issue. The community has taken these changes in stride, and ThankSwalot even jokingly updated his Twitter name to reflect the policy. Suicune Master echoed this sentiment. In the world of competitive gaming, most people know players by their chosen handles rather than their real names. Where some fighting game personalities have been able to move past these tags and transition to their full names (e.g. Justin “Marvelous” Wong, Alex “Calipower” Valle, Arturo “Sabin” Sanchez, etc. ), crafting a sort of second identity has become a vital part of growing one’s personal brand in this new age of worldwide broadcasting. While Pokkén Tournament might not be the most lucrative title on the market, players may have to start thinking about that as they compete for the Championship Series’ $25,000 prize pool.